The immediate cause was that the son of one of them angrily and repeatedly rebuked the son of another, who had married his sister, for neglecting his wife and going after loose women. The young man at fault took no notice. The ill-feeling reached such a pitch that the girl’s brother attacked his brother-in-law and killed him, with some of his relations. Then the brother in turn was murdered by those who had supported his brother-in-law. In the end not a single member of either family remained alive, except one survivor for whom there was no opponent left. At this point, more distant relatives got involved on both side, and the quarrel continued. 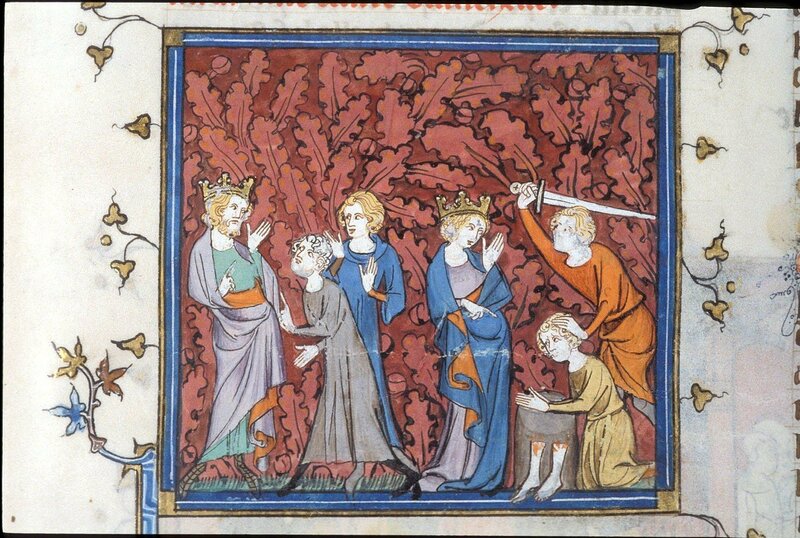 Queen Fredegund warned both groups to make peace, since this situation was becoming a “public nuisance of considerable dimensions.” However, they continued the feud, so Fredegund came up with a new plan. She invited a great number of people to supper and she made the three survivors (Charivald, Leudovald and Waldin) sit on the same bench. The meal lasted a long time, until darkness fell. The table was then removed, as is the Frankish custom, but the three sat on, still occupying the same bench on which they had been placed. They kept on drinking wine until they were completely tipsy. Their servants were drunk as their masters, and each of them soon fell asleep in the corner of the room where he had collapsed. Three men with three axes were lined up by the Queen behind the three enemies and, as they went on chatting, these swung their weapons and decapitated them with one blow, so to speak. See also What roles were available to women in Merovingian Gaul?